If you are a Sci-Fi fan like me, you'll want to check out the new COMET TV Network that is being broadcast over the air in select markets and is available to stream online for everyone else. Digital television signals being broadcast through the airwaves now have multiple levels per channel. For example, here in Metro Detroit our affiliate for the ABC network's television programming is WXYZ Channel 7. Since the digital broadcast transition, WXYZ in addition to airing ABC programming on Channel 7 also broadcasts two sub-channels as well -- 7.1 Bounce (focusing on programming for an African-American audience with similar shows as on BET) and 7.2 LAFF (a comedy channel that shows movies that will make you laugh and reruns of sitcoms from the 80s and 90s such as Night Court and Spin City). When watching television using a digital antenna, viewers can tune into channels 7, 7.1 and 7.2 and all the programming on these channels is FREE to view. Most traditional over-air broadcast networks are offering multiple channels that can be viewed by using a digital antenna and COMET TV is appearing as a sub-channel broadcast option for a variety of them. 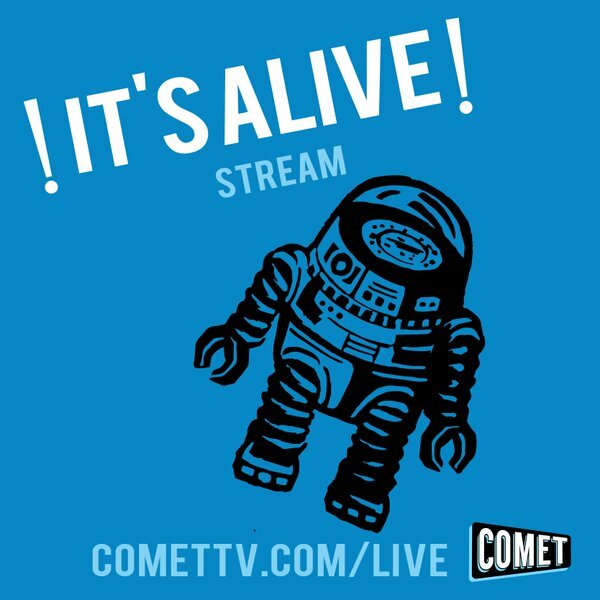 Visit CometTV.com to use its ZIP Code Finder to see if this new Sci-Fi sub-channel is currently being broadcast over the air in your area and if it is not watch the live stream of its programming over the Web instead. COMET TV has an incredible array of movies that you simply can’t get with a subscription to streaming platforms like Netflix, Amazon, or Hulu. From wild adventures on Mars to critically acclaimed classics, COMET is the ultimate home of sci-fi and horror… and it’s all totally free, no subscriptions needed. The network rotates its programming monthly so there is always something new to tune into. What I'm most excited about though is that some of my all time favorite Sci Fi shows will be returning to television as COMET TV will soon be airing the Stargate series. Stargate Atlantis will begin airing in December with Stargate SG-1 and Stargate Universe following in early 2017. I'm so geeked these Stargate shows will be back on TV and any true fan will absolutely want to be tuning into COMET TV during the next few months. In addition to television shows, COMET TV will also be airing cult classic horror and science fiction movies. Some of the movies airing in November include Babylon 5: The Lost Tales (2007), Imposter (2003), Mac and Me (1988), Mad Max (1979), Red Planet Mars (1952), Red Planet (2000), Return of Dracula (1958) and Species (1995). Visit CometTV.com for a full listing of television shows and movies they'll be airing throughout the month of November. It also provides a handy hour-by-hour guide of what is airing throughout each day. A Geek Daddy has been invited to be a COMET TV Insider so they'll be providing me with regular updates of what shows and movies they'll be featuring each month to share with you. Plus they sent me a great welcome package for teaming up with them to help spread the word about this new sci-fi & horror television network. Stay tuned because I'll also be giving away one of these COMET TV swag boxes soon on the A Geek Daddy Facebook Page.